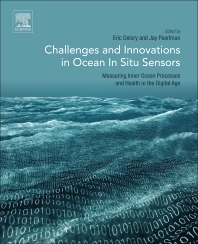 Challenges and Innovations in Ocean In-Situ Sensors: Measuring Inner Ocean Processes and Health in the Digital Age highlights collaborations of industry and academia in identifying the key challenges and solutions related to ocean observations. A new generation of sensors is presented that addresses the need for higher reliability (e.g. against biofouling), better integration on platforms in terms of size and communication, and data flow across domains (in-situ, space, etc.). Several developments are showcased using a broad diversity of measuring techniques and technologies. Chapters address different sensors and approaches for measurements, including applications, quality monitoring and initiatives that will guide the need for monitoring. Dr Delory is currently Head of the Observatory at the Oceanic Platform of the Canary Islands. He coordinates NeXOS, a European collaborative project that develops new in-situ ocean sensors, through innovations aimed at increasing cost-efficiency of ocean observing systems, e.g. more reliable, interoperable, multifunctional optical and acoustic sensors. He has led the effort of the European Seas Observatory Network (ESONET) of transposing Global Earth Observation System of Systems (GEOSS) guidelines to sensor and data interoperability on European seafloor and water column observatories. He co-authored more than a hundred publications in the above fields.